Boffins have designed a pair of specs with an embedded head-up display and tracking technology to let the wearer to manipulate content with their eyes. 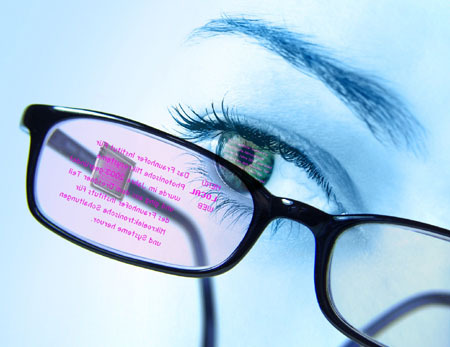 The prototype hi-tech specs - designed at Germany's Fraunhofer Institute for Photonic Microsystems (IMPS) - feature a 19 x 17mm CMOS chip that projects an image onto the wearer’s retina. The picture appears as though it’s about 1m in front of the user. Photo-detector based Eye-tracking technology incorporated into the chip allows the wearer to change the projected content simply by moving their eyes or fixing their gaze onto a certain point, such as a picture or word. Without having to use any other devices to enter instructions, the wearer can display new content, scroll through the menu or shift picture elements, said Dr Michael Scholles, Business Unit Manager at the IMPS. The picture is projected using a matrix of “high luminance” OLEDs to ensure the image is visible whatever the ambient lighting condititions and whatever is in front of the user. The image is fed from a phone, PDA or personal video player. “We want to make the eyeglasses bi-directional and interactive so that new areas of application can be opened up,” Scholles said. He didn’t state if the glasses will ever go into productuion, but he does have his eye in various industries – including construction and medicine – where a specs-mounted handsfree display would be useful.